Get the Band's Signature Signal Flag! Two new Incidents Tokyo releases are set for August 29, ‘The Midnight Broadcasting,’ and ‘bloopers and highlights.’ Buy them both at the same time and receive a bonus gift (while supplies last). The bonus gift is none other than a signal flag. Incidents Tokyo has produced a fair number of original flags to date, but this new design will surely go down as the band’s signature signal flag. If you are a fan, you will want it, so don’t miss the chance. *The bonus gift is available only while supplies last and is not available at all outlets. Check with EMI Music Japan for details. An important message from Incidents Tokyo. The final show of the Incidents Tokyo’s final tour, Domestique Bon Voyage, was held at the Budokan on February 29. The show was filmed in its entirely and will be released on video on June 13 as, aptly, ‘Bon Voyage’. EMI Music Japan has also set up a special page with concert photos and other content for your enjoyment. Three Tower Records locations will be exhibiting concert attire and other items to commemorate the release of ‘Bon Voyage.’ Go check it out. *All different attire is exhibited at each store. *Other items are on exhibit at the Shibuya store from June 12 to June 18. *Digital downloads available as of June 13. As of June 13, “Brand New Civilization,” “Fly Me To Heaven,” “Ideal days for ultramarine” and “Identité de la Lune” are available in the Chaku-Uta, Chaku-Uta Full, Chaku-Movie and standard download formats. EMI Rocks was held February 19 and featured an appearance by Incidents Tokyo. Highlights of the festival will be broadcast on television beginning March 30. *Scheduled to re-air on future dates. Check the EMI Rocks official site for details. 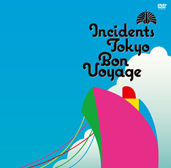 Incidents Tokyo's live best-of album, 'Tokyo Collection,' was released February 15. The album features 14 select tracks taken from the band's live performances. 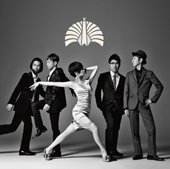 It serves as testament to Incident Tokyo's prowess as a live performing band. See the Discography page for the track list. "A Separation" can be downloaded as a Chaku-Uta or Chaku-Uta Full. It is also available at the iTunes Store. "Vengeance" off 'Tokyo Collection' is available exclusively on iTunes. “Optical Androgyny” eyeglass frames sold as Incidents Tokyo Discovery Tour merchandise are now on sale in limited quantities at 19 eyeglass stores nationwide. 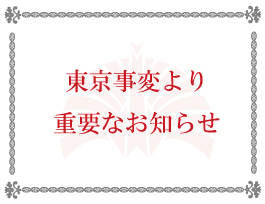 Please inquire directly with the store regarding sales. 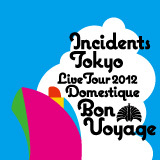 Incidents Tokyo will be playing their final shows in February under the banner of the 2012 Domestique Bon Voyage Tour. See Concert Information for ticket information and other details. Bon Voyage Tour merchandise is all about seafaring. The shows on February 28 and 29 at Nippon Budokan will also feature exclusive items. Check out the merchandise page for details. 'Discovery,' released on February 15, is collection of live performances taken from Incidents Tokyo's Discovery Tour held last year. It is sure to please both people who made it to a show and those who weren't able to. It is available in two formats, DVD and Blu-ray. On EMI Music's site, you can now preview clips of "Fly Me To Heaven," "Relative vs. Absolute," and "Brand New Civilization," all of which are found on 'Discovery'. It will include all 30 songs played at the show, providing you the opportunity to enjoy the final phase of Incidents Tokyo over and over again. See Discography for the track list. The final show on Incidents Tokyo's 2012 Domestique Bon Voyage Tour, held at the Nippon Budokan on February 29, will be the band's last concert appearance. To allow as many fans as possible to experience the show, it will be shown live at 108 movie theaters around the country. It is also scheduled to be shown at theaters in Hong Kong, Taiwan and Singapore--an unprecedented scale for this type of event. Date: Wed., Feb. 29, 2012 at 7:00 p.m. Details and contact information can be found on the event's official site. Please check here for advance ticket reservations and other information. Band merchandise will be sold at theaters that show the concert. It will include items exclusive to the event. Check here for details. The initial number of theaters showing the concert was announced as 108, but it has since increased to 114. Venues in Asia have also increased. Go here for a list of showings. Incidents Tokyo will be appearing at EMI Rocks 2012, an event being held by EMI Music on February 19. See Concert Information for ticket information and more details. Incidents Tokyo merchandise will be sold at the venue on the day of the event. It will include a new "Dream Woman" towel and the official Incidents Tokyo book "Channel Guide." The vendor is located outside the arena, so anyone can purchase the merchandise. Go here for more details.